Today is #FlashbackFridays, and as it is the end of Passover, we are thinking back on all of the flourless foods we have created and written about over the years. For today’s post, we decided to share the “favorite five” with all of you. In order to determine what five photos have gotten the most “likes”, we went back and looked through each post’s views. We were excited by what we found. A list of really fun options to keep in your back pocket for Passover next year or for your next gluten free meal. #5: As seen in our post, Making Matzah Ball Soup With Mom – Although it is not easy to give up bread for a whole week, there is something we always look forward to … matzah ball soup! For as far back as we can remember we have always made a huge pot of this comforting soup to last us through the week. When we were younger, we would help our mom prepare the vegetables and form the matzah meal into balls to plop into the pot watching as they fluff up. The house always smelled the best on these days. Here’s a look back from a few years ago when we got the opportunity to relive this childhood memory as we once again made matzah ball soup with Mom. #4: As seen in our post, Flourless Cake – As many of our loved ones celebrate their birthdays during this time of year, it is very common that we hear them complain that they are required to have a Passover (flourless) cake on their birthdays. This led us to conclude (a few years back in honor of Lauren’s husband Scott’s birthday) that there must be a way to spruce up a flourless cake, make it less dry, and more appetizing. You can make it pretty while you are at it too. 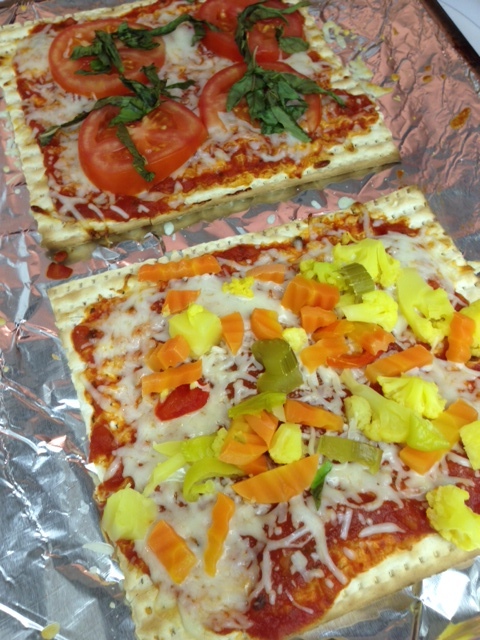 #3: As seen in our post, Matzah Pizza – One of our favorite things to make during this holiday is matzah pizza as it is as close as we can get to having a hearty Italian meal. 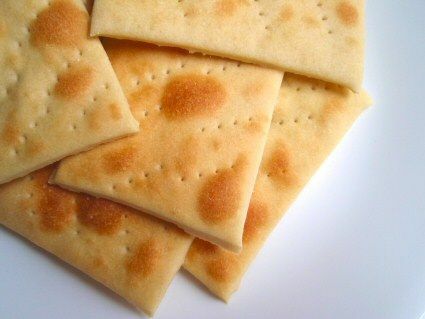 We love thin crust anyway, so it really doesn’t feel like much of a hardship to us to have matzah instead of pizza dough. A few years ago, we were inspired by two of our favorite pizza spots in deciding which toppings to put on our homemade varieties. 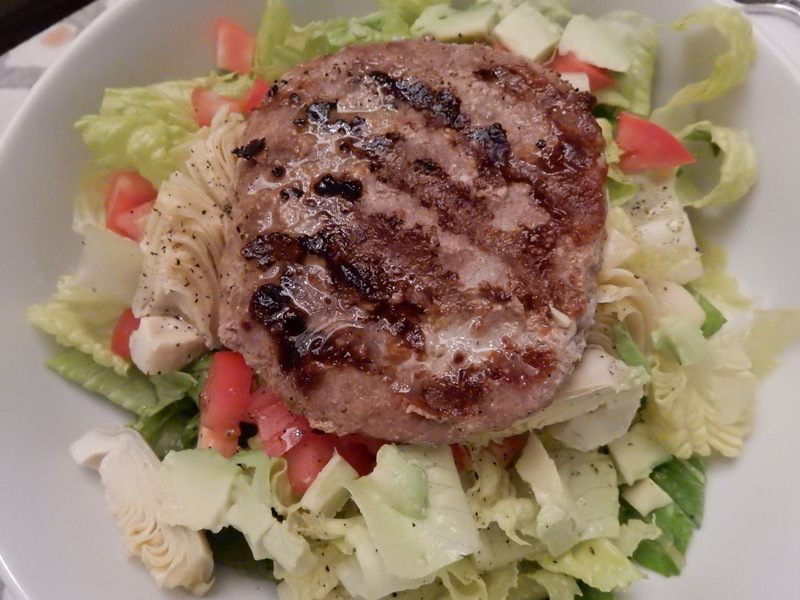 #2: As seen in our post, Food Fridays: Turkey Burger Salad – A look at one of our favorite no carb meals of all time! Who needs a bun when you have a lush green salad full of tasty veggies? 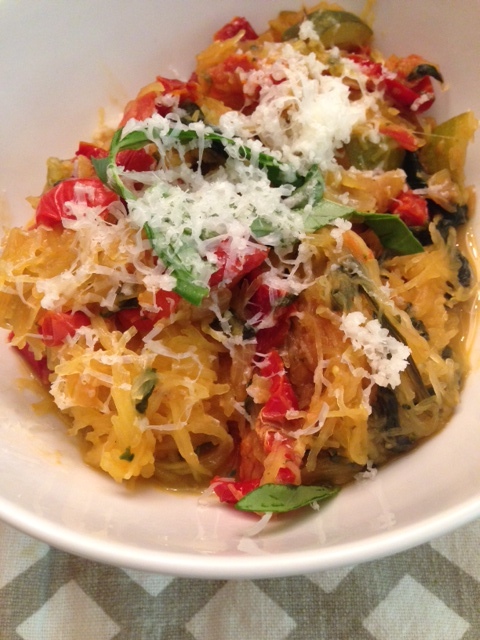 … and the #1 most viewed post: As seen in our post, Food Fridays: Healthy Eating in the New Year – This may look like pasta, but there is not a single noodle in sight. This delicious recipe was made from all Farmer’s Market ingredients … veggies only with a sprinkle of sheep’s milk cheese on top. This Passover has been so much fun and full of gluten free goodies … Why not incorporate this practice into your regular weekly cuisine? As always, we are extremely grateful for the feedback our readers have provided us! Keep the love coming whether it be on Pinterest, Facebook, Instagram, and by visiting our site each Monday, Wednesday, and Friday to see what we have in store. Have a great weekend from Side by Side Design! With both Mother’s and Father’s Days just around the corner, we thought it might be helpful to provide you all with some ideas for how to make the parents in your life smile. We have been holding onto these photos since this time last year with the intention of sharing our handmade cards and thoughtful gifts with all of you. It’s not too late … you have plenty of time to get out there and start preparing your cards and gifts too! Handmade cards are always the best! 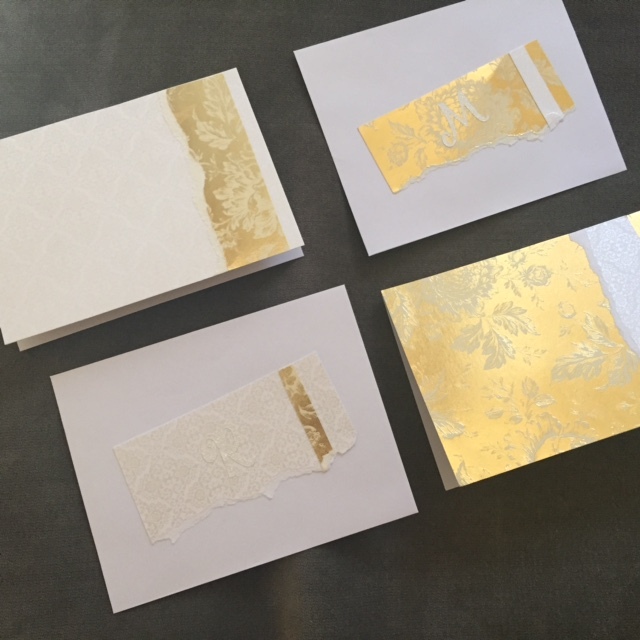 Tami made her Mother’s Day cards last year with some really fun metallic scrapbook paper and her famous ripping technique. A simple initial reminded her who to give each one to, and she even gave them out to her sisters who are both now moms. What a special way to thank them for bringing beautiful nieces and nephews into her life and to tell them that she hopes to be as amazing of a parent some day soon. Lauren knew that the best way to pull at her and Scott’s parent’s heartstrings was to give photo gifts of their daughter Ava. Why stop there? 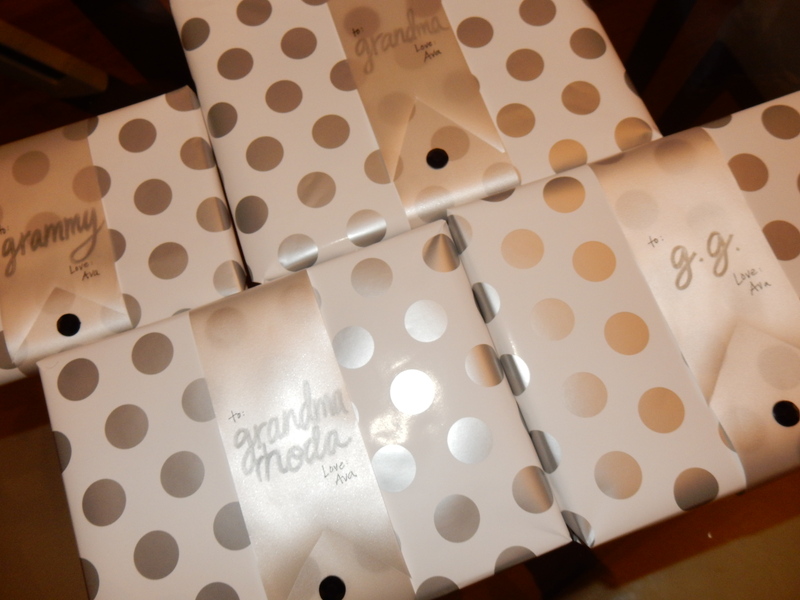 This was a great gift for their grandparents too! 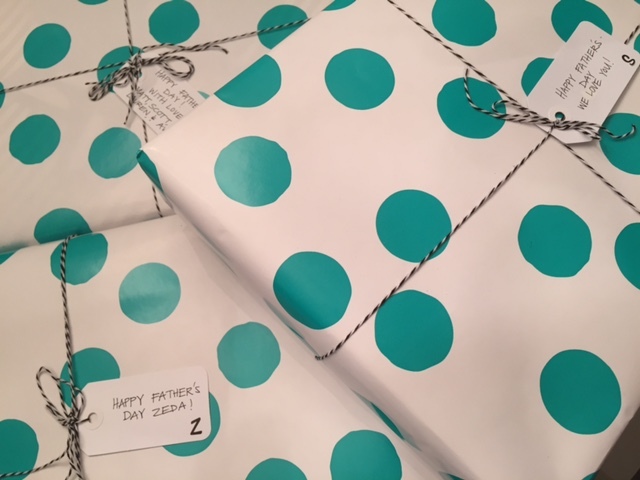 Each gift was beautifully wrapped and personalized with Ava’s name as the gift giver. 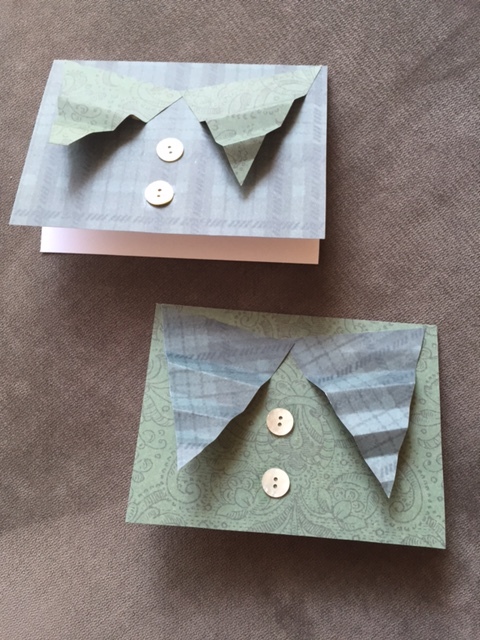 Tami made handmade cards for the fathers in her life as well. 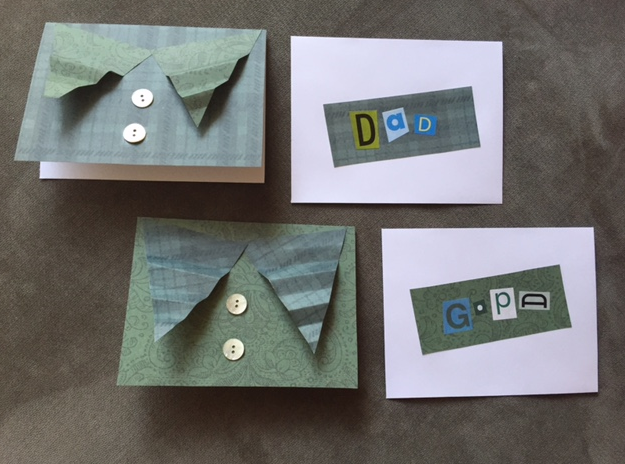 She used funky patterned paper and real buttons to give each card a “button down” feel and finished off each envelope with fun sticker letters for “Dad” and “G-Pa”. 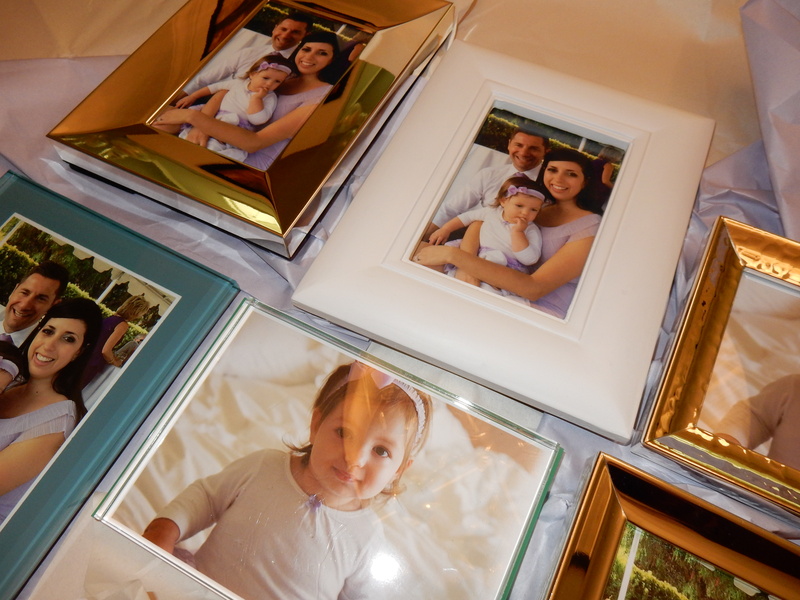 The rest of Lauren’s frames were all wrapped up and ready to go for Father’s Day. 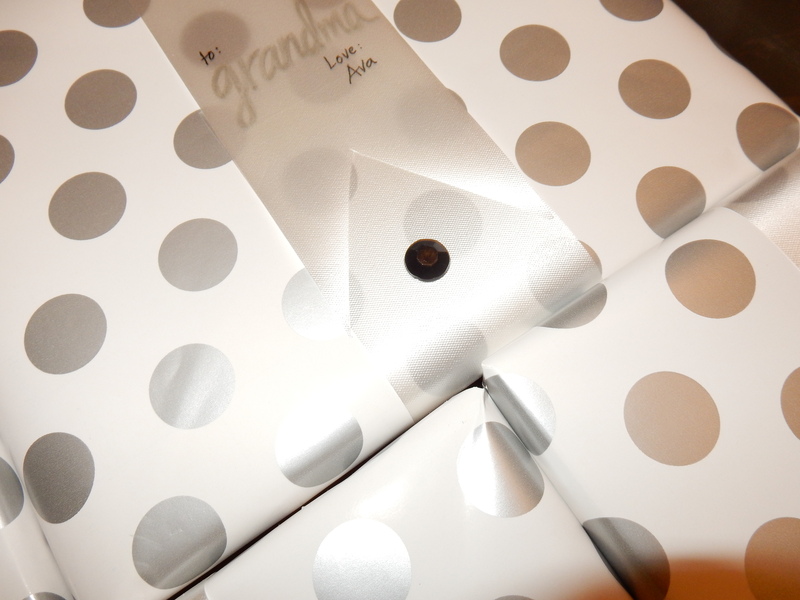 She stuck with the polka dotted theme and added a little twine and a hand written note. What will you gift the mothers and fathers in your life this year? Have some great ideas to share? Please make use of our comments section to provide more ideas for those in need. 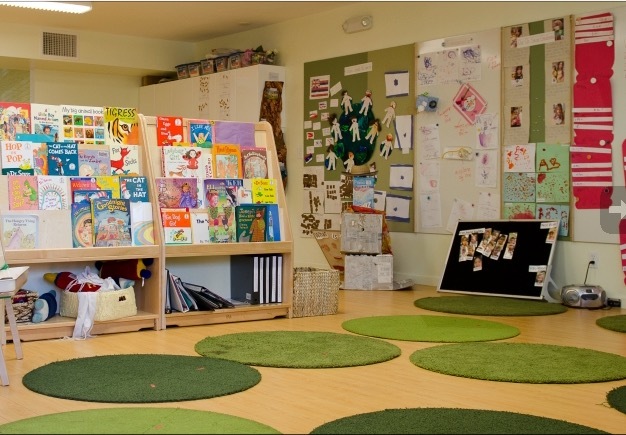 In our previous posts, Preschool Library Design and Resource Room, I showcased two spaces in my daughter’s school that I have had the privilege to help design. I am so glad that I have been able to use my design expertise to give back to this special school, and I love the way Ava is especially proud of each of the spaces I have worked on thus far. I am even more pleased to say that this project is only just beginning! In fact, I know that the principal has great plans for how to bring the look we have established through to the rest of the school one room at a time. Who knows, maybe we will even be able to finish by the time my twins graduate from University Synagogue. The space we have decided to work on next is one that is near and dear to my heart. 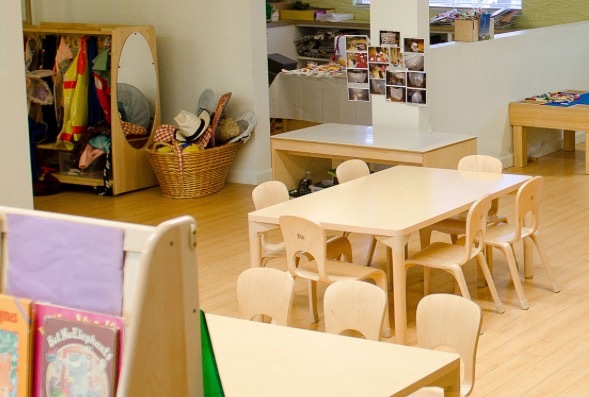 It is the largest classroom in the school and is used for the Mommy and Me program. Ava started her journey at University Synagogue in this very classroom, The Butterfly Room, and we have many fond memories including her first steps, lots of Shabbats, and circle time. As I attended each of these classes with Ava, these are all memories I will hold onto but by far the memory that I hold onto the most from that year was of a very special woman (the assistant teacher in the class), Flora. She had a way of making people feel comfortable and truly helped our transition into the Butterfly Class easier. She made each person she met feel very special as if they were the only one. Unfortunately, for us we only knew Flora for a few short months. May her memory be a blessing, but I believe she was brought into our lives for a reason. 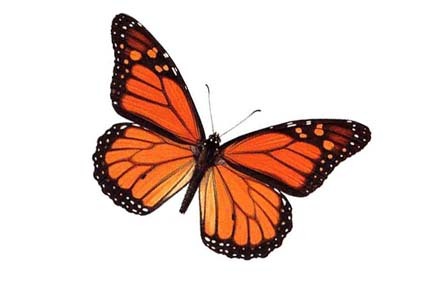 A few weeks after her passing, I saw a single monarch butterfly float through the air above the school playground and knew that Flora was watching over us. Just like the ones I saw throughout my pregnancy with Ava that I believed to be a sign of comfort from my grandmother Aviva (who Ava was named for). How perfect is it that this room, Flora’s Room, is used for the Butterfly Class? It was meant to be. 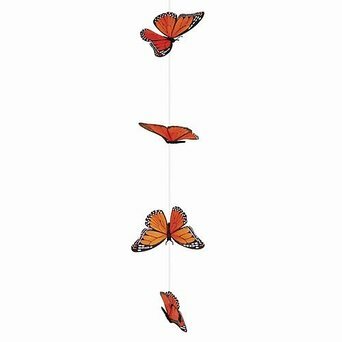 We just started working on the design for this space, in honor of this amazing woman, and opted to keep the overall feeling calm, natural, and with a hint to the butterfly theme. Using monarch butterflies, of course. Natural wood tables and chairs, baskets for toys, and wooden book shelves is what this space really needs. 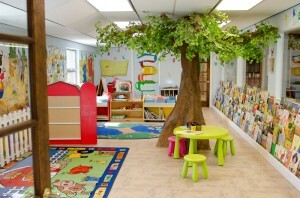 I love the idea of incorporating some sort of indoor play area such as this. To soften up the room, I’d like to see some sort of wood flooring and to get rid of the fluorescent overhead lighting … This is all part of the plan. I’d love to see some fun round rugs as well in different shades of green, orange, and purple for each mom to sit on with their little one. In addition, there are two posts in the room. I think it would be fun to turn one into a tree. This could cozy up the reading area and be very inviting. If all my dreams come true, there will be hanging butterflies from the tree in memory of Flora. As you can see, I take this project very seriously and am excited to see it come to life. 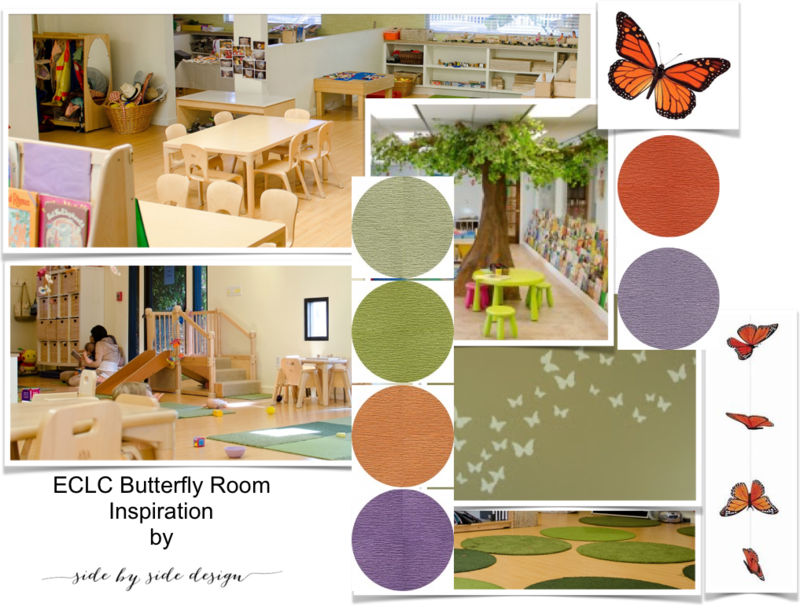 The school is working on fundraising to be able to begin this project, and selfishly I am hoping that when Cara and Sienna become “Butterflies” we will be able to enjoy this space. Donations are welcome and encouraged. Feel free to contact us personally or University Synagogue for more information. This coming Friday is the first night of Passover, a holiday that has always been very meaningful and special to us. Thinking back on years past brings us lots of joy. We can remember many seders from our childhood where we and our siblings would put on performances for all of our dinner guests. The “chefs” in the family would make traditional dishes that we would anticipate year after year and on occasion create something new to mix things up. Of course, who can forget every child’s favorite Passover game? We loved searching for the afikomen (hidden matzah) and always knew that even if we were not the lucky one to find it, we would still get a crisp, new two dollar bill from our Grandpa Sam. Now that we are all grown up, the seder brings new meaning and significance. It is a time for Lauren to pass the traditions we grew up with on to her children and a time for Tami to celebrate with her new family, incorporating some of their traditions into her repertoire. We are also always looking for new ways to entertain guests in a unique way. This year, we will not be the ones hosting, however in the future we plan to invite our loved ones into our homes for this very special holiday. For now, this inspiration post will feed our need to create a seder that is fresh and new with all of the elements of an al fresco dinner party. We are experiencing a heat wave here in Southern California this week, and that is why we can’t imagine this seder taking place anywhere other than outdoors. We thought it would be fun to replace some of the heavier traditional foods from the seder such as brisket, matzah kugel, and matzah ball soup with some lighter options that compliment our al fresco theme. If you are going to make up an event, you might as well make up a fake place to live as well! This kitchen is the perfect place to prepare your al fresco meal before setting up outside. 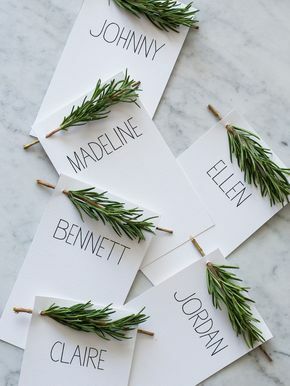 Each dinner guest will feel special when they find their name at the table. 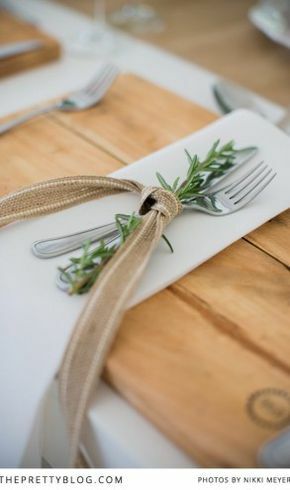 A small sprig of rosemary is added to the silverware for another special touch. 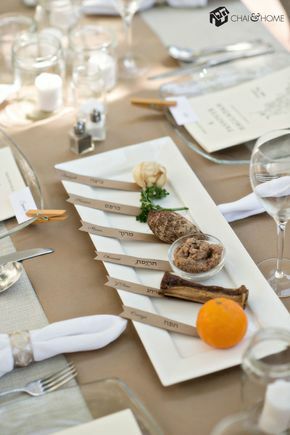 We love this untraditional way of displaying the seder plate items. Each one symbolizes something different and are tagged accordingly. The orange is a modern touch that represents women and equality. 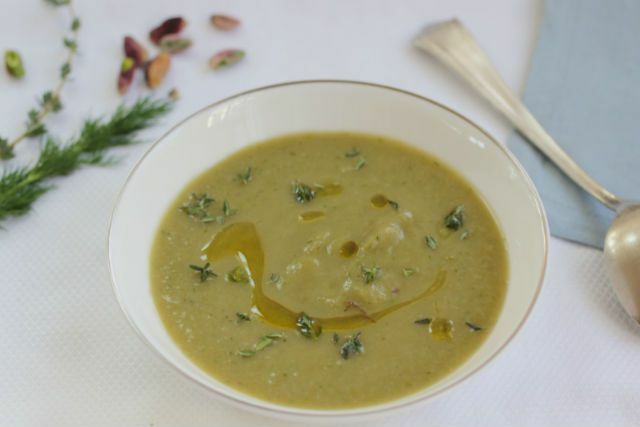 Why not try vegetable soup instead of matzah ball this year? Here’s a great recipe we found. 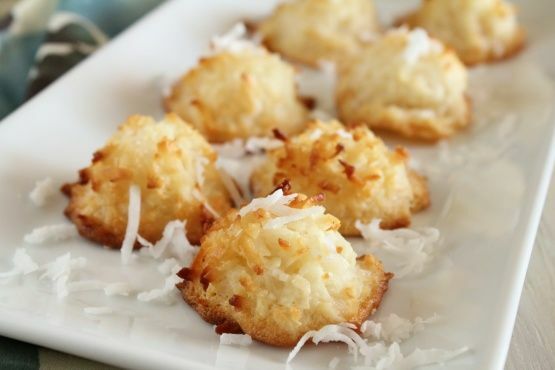 … and you can’t beat homemade macaroons! 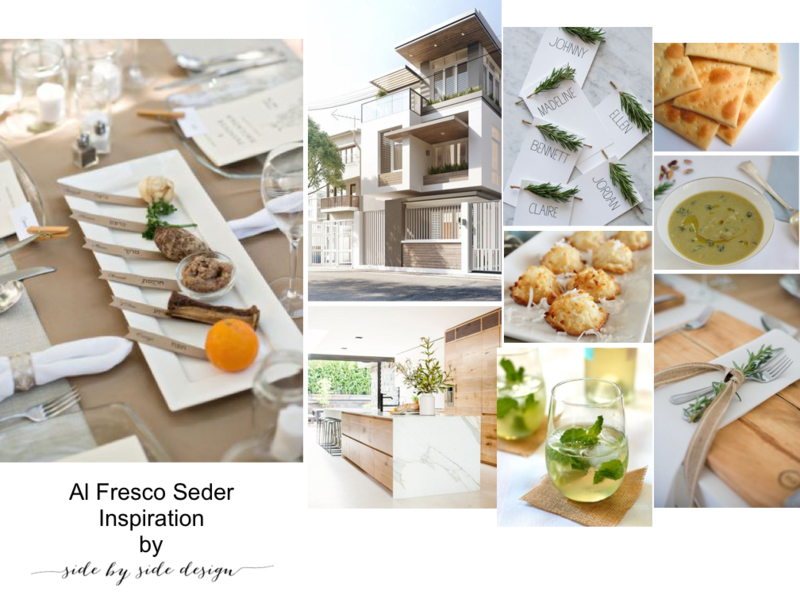 We had way too much fun preparing this al fresco seder inspiration board for all of you and truly can’t wait for this weekend’s festivities. We hope that you have liked it as well and that you have been able to get inspired by some of our ideas. Enjoy your seder this year, and keep us in mind should you ever decide to try something new or need help setting up your unique holiday look. After taking a short amount of time off from working (and from our blog posting last week), I am officially back at it! I truly am not the kind of girl who can stay away from work for too long. 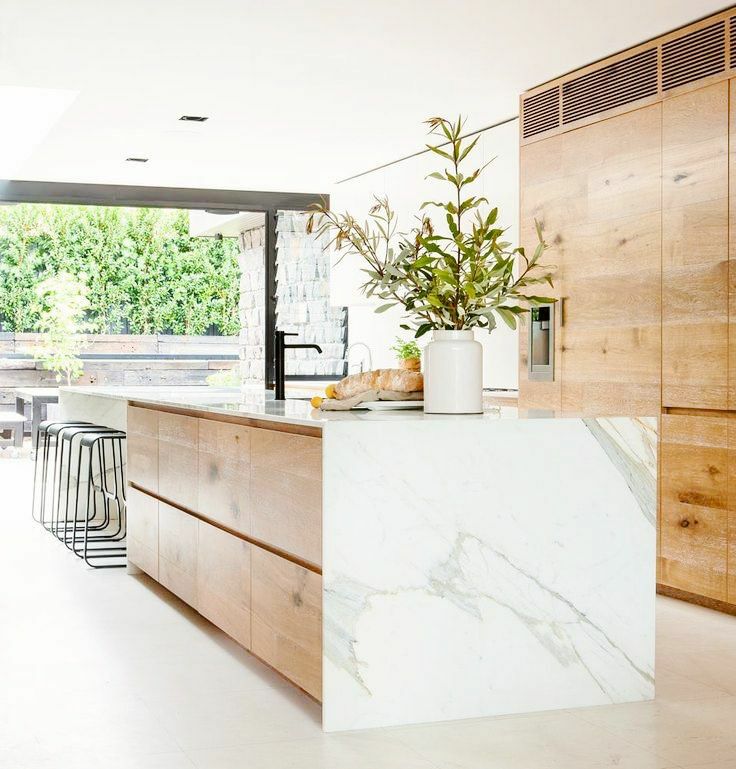 So when a few of my interior design clients let me know that they would be “ready as soon as I am”, I knew that there was no better time than the present to jump back in. Earlier this year, I began a project working for a new client (also known as Tami’s soon to be Mother-in-Law). Before I had my twins, she and I settled on a color scheme and the inspiration for the spaces that she is looking to redesign. With the wedding approaching, she is anxious to get things in order so that she can host family and friends for all kinds of pre-wedding festivities. We met again last week and we now have a final plan for completing all of the common areas in her home. 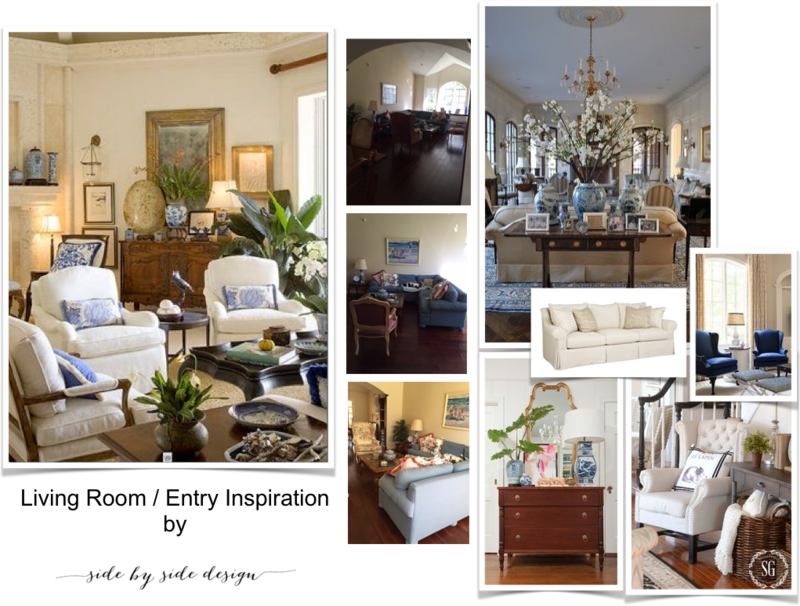 To begin any design project, I put together inspiration boards that show the overall color scheme and concept for each space. When working on numerous rooms in a house at once, I like to also put together one board that shows how these spaces flow from room to room. 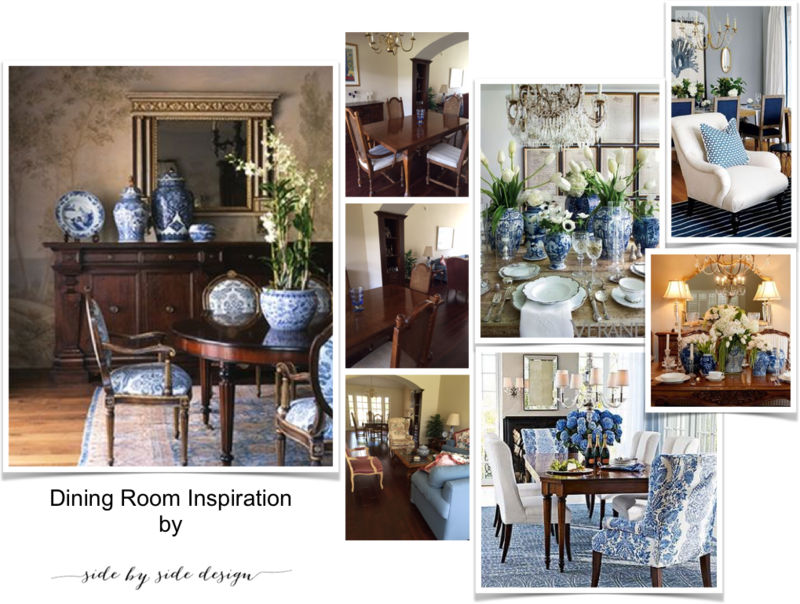 For this particular project, I was especially inspired by the collection of blue and white ceramic pieces that Karen has collected over the years, and decided this was the perfect starting place for the design of this home … traditional, clean lines, and lots of blue and white. For the living room, I wanted to keep the pieces relatively simple so as to highlight all of these fun accessories and Karen’s requests were to make the space comfortable, light and bright, and entertainment worthy. 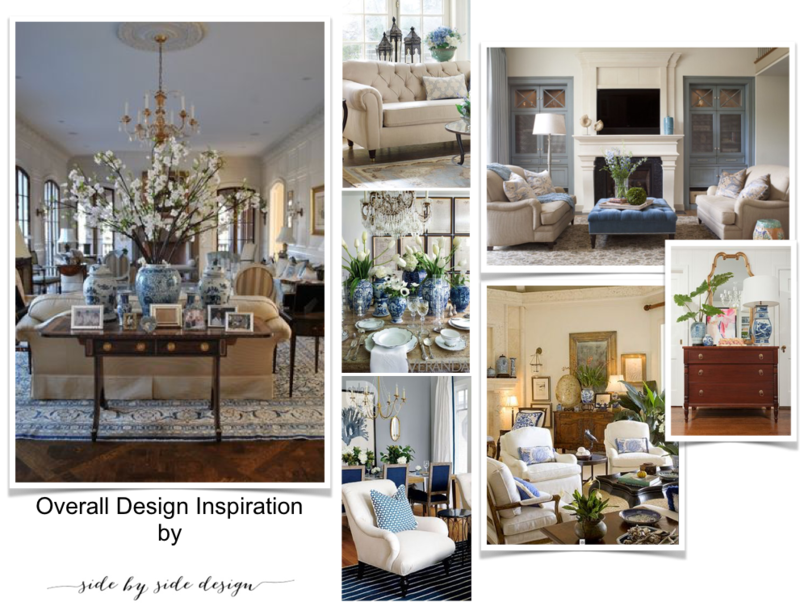 The entry space is really just an extension of this living room, and I feel that a simple chest or console with a mirror above and at least one blue and white piece will really help to tie the whole look together. The dining room is also connected to this main living room. 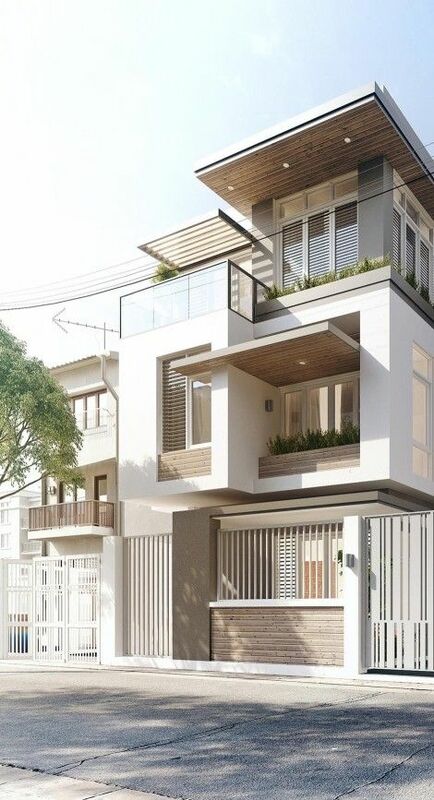 I feel that coordinating the colors is a must, but I also want to add in a few interesting details to give this space the special attention that it deserves.